The Colorado Psychological Association is the representative voice of psychology in Colorado. Founded on October 23, 1946, the Colorado Psychological Association (CPA) represents all sectors and specialty areas within the field of psychology. 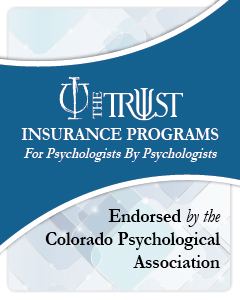 Colorado psychologists demonstrate their commitment to psychology as a vital profession of the highest standards through their membership and participation in the CPA. CPA is a statewide organization with hundreds of active members. Given this diversity, CPA is able to respond to the needs of Colorado's citizens. When you join CPA, you become a part of the national and statewide efforts to increase public knowledge of the unique qualifications and expertise of psychologists, and to advocate for psychology and mental health. By completing the application (online or paper), you authorize the release of your CPA Membership Application, and any additional material you may have submitted to support that application, to the CPA Membership Committee, Association Management, and CPA Board Leaders, who transmit and store the data you submit in a variety of electronic archives. If you answered “yes” to any one or more of the four Professional Ethics Declaration questions in the application, please note that this material may be released to the CPA Ethics committee for their review in order for them to make a recommendation to the CPA Membership Committee and/or the CPA Board of Directors as to the status of your application. Missing or false information may lead to denial or revocation of membership. If your application is accepted, you agree to abide by the rules, policies, and bylaws of the Colorado Psychological Association and the Ethical Principles of the American Psychological Association as interpreted by the Association. NEW MEMBERS: As soon as you submit your application and applicable dues to CPA, your membership is considered provisional pending final approval by the Membership Committee and the Board of Directors (with option to extend provisional period if needed). You will receive notification regarding their decision within two to four weeks. If your membership is denied, a full refund will be provided. The CPA Office sends out emails notifying members of their membership expiration date. Any member who fails to pay the membership dues shall be dropped from membership, unless the Board of Directors votes otherwise. If you are submitting the paper application and paying by check (made to the Colorado Psychological Association), please send to: CPA c/o Civica Management, P.O. Box 3406, Englewood, CO 80155.